Top row (left to right): 1. Barbara Solomon, 2. Matt Herbert, 3. Sharon Quintoa, 4. David Ellis, 5. Sharon La Scola, 6. Ken Dubuque, 7. Suzy Johnson, 8. unidentified, 9. Kathi Hall. Second row: 1. Brian Candido, 2. Marcy Flanders, 3. Greg Brown, 4. Kristy Dolstra, 5. Scott Abrott, 6. Mike Rhoden, 7. Robby Quatelbaum, 8. Ron Lucas, 9. Eve Zucker. Third row: 1. Bill Strauss, 2. Danny Lastiri?, 3. Steve Shell, 4. 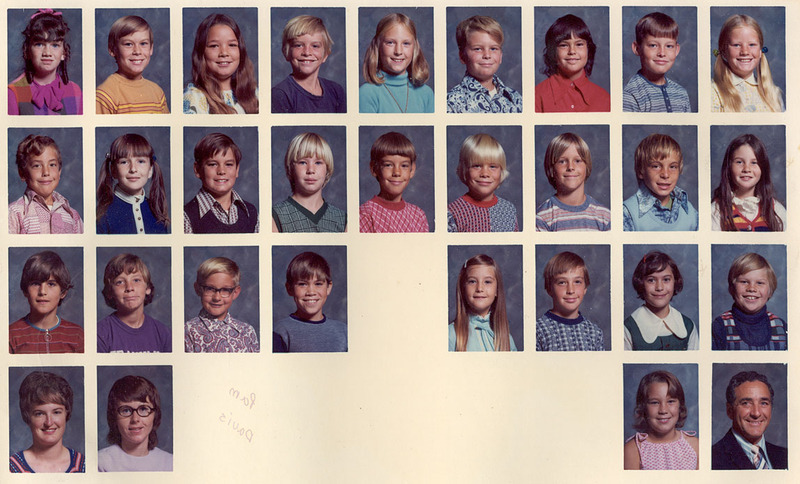 Bob Peterson, 5. no picture, 6. Kimberly Woods, 7. Jon Jackson, 8. Sara Adibzadeh, 9. Donny Malia. Fourth row: 1. Mrs McLaughlin, 2. Mrs Howell, 3. no picture, 4. no picture, 5. no picture, 6. no picture, 7. no picture, 8. Pam Davis, 9. Mr Mercy. Credits: From the collection of Kimberly Woods Barry.